It’s not often HighwayHighlights likes to give a negative review of an attraction in our home state. 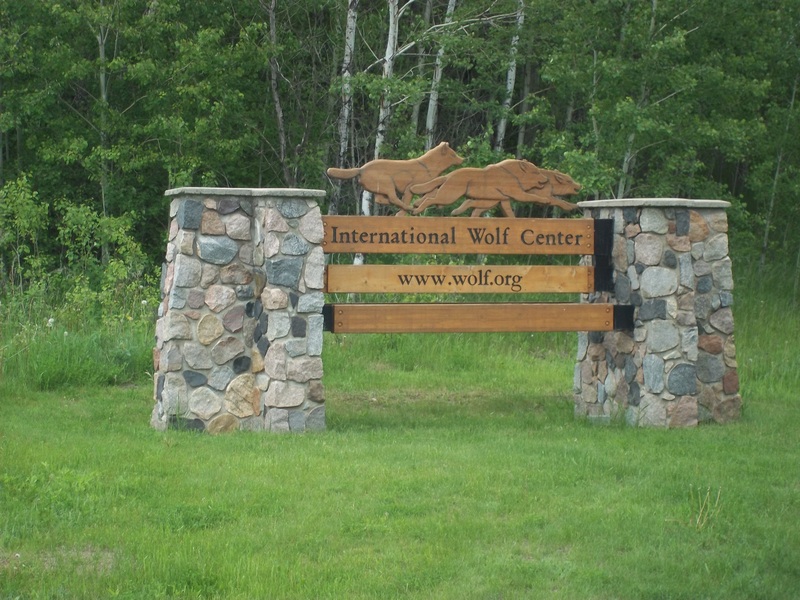 But this week we take a look at the highly-touted International Wolf Center in Ely, MN, and reminisce about what a letdown it ended up being. We toured the facility back in June 2013 during a camping trip to Ely, and left thoroughly disappointed. Read on to find out why. 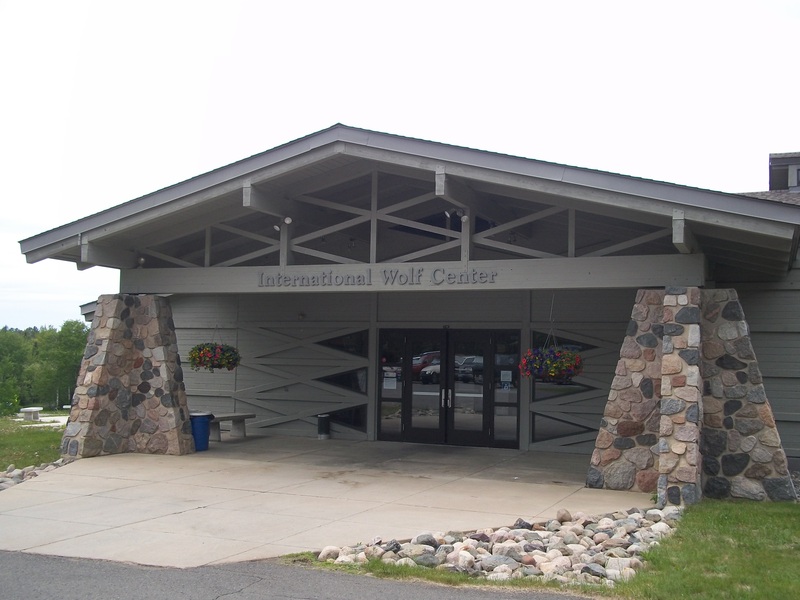 One of Ely’s featured attractions, the IWC features a state of the art facility that opened in 1993 by world-renowned wolf preservation specialists. The place is nice, no doubt about it. The organization is committed to advancing the survival of wolf populations by teaching about wolves, their relationship to wild lands, and the human role in their future. Their intention is good, no question. Wolves are an elusive and endangered creature, and sightings in Minnesota, though rare, are always exciting. I have yet to see one in the wild although I have heard them howling before. The IWC is just outside of Ely up a small hill. 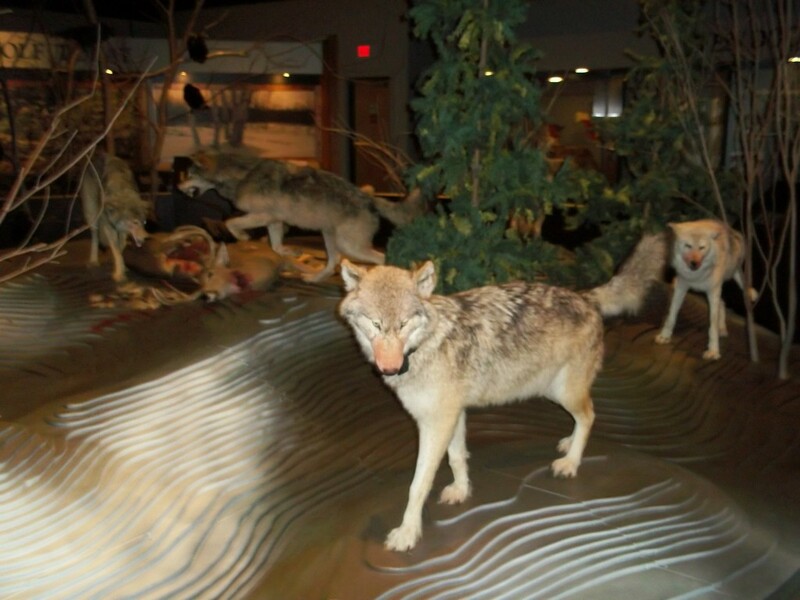 After paying the admission fee of $9, you enter the facility, which houses a theater, gift shop, refreshments, and a pretty good interpretive educational center with information on the lives of wolves and their interaction with man. This part of the museum is actually quite interesting. There are interactive displays that play different howling sounds, facts and wolf hotspot maps. The middle of this room (pictured below) has stuffed wolves set up in kill scenes and on the prowl. Taxidermized ravens overlook the grisly site from above. It’s interesting to see them up close to gain perspective on their formidable size. The reality was really quite different. Maybe we came at the wrong time. (A Saturday in June? Why would it be jammed with people? )… or maybe the excitement of possibly viewing wolves up close was just too much. When we made our way to the viewing area, we noticed one key thing missing. The many wolves pictured in the ads in tourism bureaus and brochures were nowhere to be seen. And when we finally did locate the wolves, there were 3 of them total. And they were sleeping. Yes, 3 total in this huge enclosure, all down for the count enjoying an afternoon siesta. No amount of kids banging on the glass was getting these bad boys up. Perhaps the wolves are jaded from being forced to live in captivity, devoid of any hunting, traveling, fighting, mating, etc. And it’s not like the workers can go in there and poke them with a stick just so camera-happy tourists can catch a glimpse of them doing something other than laying docile. I suggested letting a deer or a rabbit or some other prey loose in their and letting us watch, but that advice seemed to have been lost on anyone who’d listen. After looking at the sleeping canines for about 5 minutes, we hastily made our exit, onto bigger and better things. 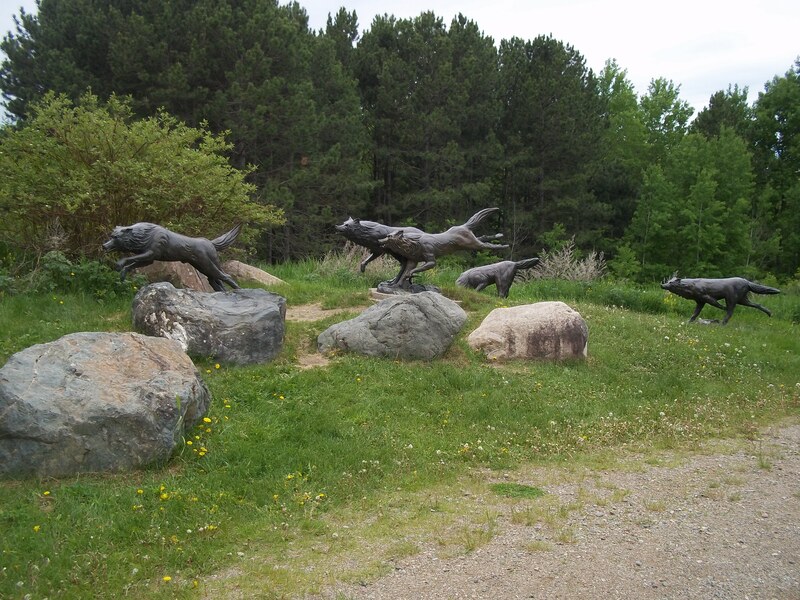 Such as the bronze wolves statue in the parking lot (below). At least those wolves are doing something besides sleeping. So the IWC ended up being a major letdown. I have seen better wolf action at both the Minnesota Zoo and Como Zoo in the Twin Cities. 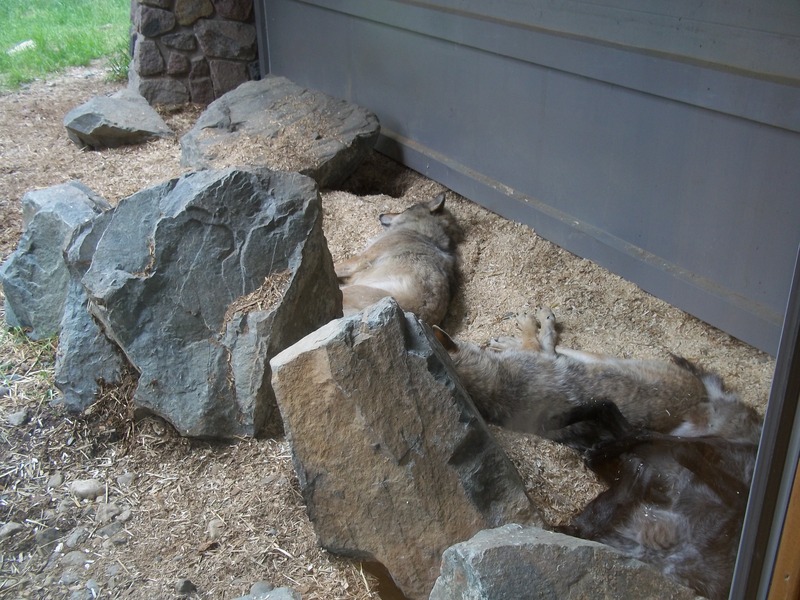 If you are going to promote yourselves as the largest and most comprehensive wolf center in North America, maybe you should have more than say, 3 wolves in your viewing area. Just a thought. I guess I wouldn’t make a return visit, nor would I really recommend it if you are looking to see wolves doing anything interesting. Maybe you’ll have better luck spotting one in the wild. 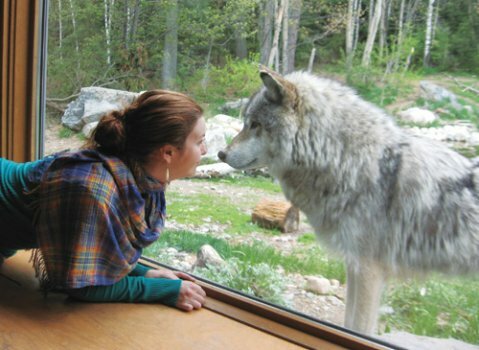 I should note that the Center offers afternoon, weekend and week-long programs that include howling trips, radio tracking, snowshoe treks, family activities, dog sledding, videos, presentations, flights over wolf country, demonstrations and hikes. And it’s a nice place with a great deal of information. Just don’t expect too much in the viewing area. 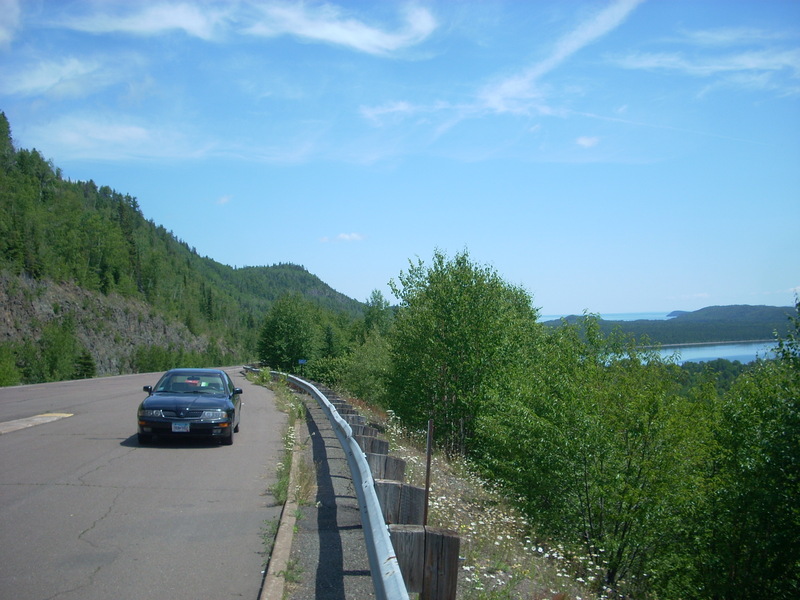 While in the area: The abandoned Tanner Building has an interesting history, and nearby is the Cabin of the Root Beer Lady, and the amazing Soudan Underground Mine. Ely is packed with other things too, as previously mentioned.